Ease the worry and stress of your removal by taking advantage of our experience and expertise. We understand that house removals involves much organisation and we will tailor-make a removals package to suit your requirements whilst recommending any more economic or practical way to make your removal a smooth and trouble-free experience. When you move with our removals company in London, every care will be taken to protect and transport your belongings safely. Realistically however, there is always a slight chance that something may get damaged. Our removals company in London includes liability cover of your possessions whilst they are in our care. Details are given with every house removals quotation. Remember that individual items may be moved. No job too small is our removal or relocation service We also offer boxes and packaging materials for sale plus a full cleaning service after we have emptied your accommodation. For a fast anser to your enquiry please call the freephone number 0800 0234 610 or use the quote form. Whatever you require, we offer the very best removal and relocation service at the best value for money in the area. For a fast and efficient service, simply call us now on 0800 0234 610 for all your removal needs and packaging supplies. 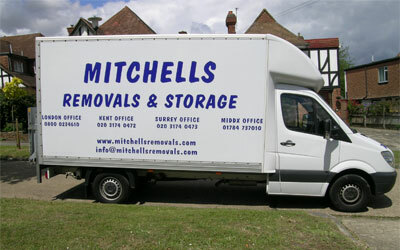 Mitchell's Removals: 8 Shepherd Market, Mayfair, London, W1J 7JY.